Are There Turtles Without A Shell? Perhaps you are wondering if turtles without shells exist. The answer is yes, though only in rare circumstances. Though some people think that the shell of a turtle is like a hermit crab’s shell, and is able to be separated from their body, a turtle’s shell is part of its body and barring rare events like birth defects a turtle won’t lack a shell. Though it’s believed that the ancestors of turtles may have lacked shells, all modern turtles possess shells. The carapace or shell of a turtle is part of the turtle’s body, linked to their backbone and chest cavity. It encases vital organs like their liver, stomach, kidney, heart, and intestines. Shells are made out of plates of bone. Turtles are cold-blooded animals of the order Testudines. There are 356 known species of turtle alive in the world today, though some of these species are critically endangered. 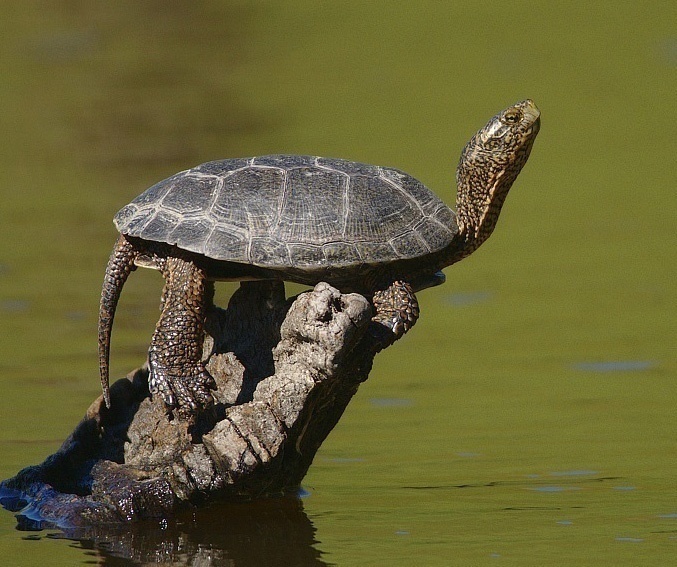 Along with some mammals, birds, and reptiles, turtles are classified as amniotes, a clade of vertebrates. The largest turtle in the world today is the leatherback sea turtle, which can weigh upwards of 900 kg or 2000 pounds. It can also reach a curved shell length of approximately 1,75 meters or 5.7 feet. Meanwhile, the smallest living sea turtle is the speckled padloper tortoise, weighing only about 140 g or 4.9 ounces and being only about 8 cm or 3.1 inches in length. Turtles are capable of retracting their next into their shells, and how they accomplish this is one of the ways that scientists differentiate between different types of turtles. Turtles of the suborder cryptodira retract their head straight back into their shell, while those of the suborder plurodira retract their head to the side. Turtles that spend most of their time on land have eyes positioned between the front and sides of their face, using them to look down at objects which are in front of them. Meanwhile, those who spend much of their time in bodies of water, such as sea turtles, may have eyes located closer to the top of their head. True turtle shells are made of keratin and bone. Both skeletal bone and dermal bone comprise the shell of a turtle. The top of the shell is referred to as the carapace. Meanwhile, the ventral portion of the shell is referred to as the plastron. The carapace and plastron are joined by an area dubbed the bridge, which is connected with a strut that binds the two halves together. The carapace is divided into 16 different sections called plurals, with eight on each side. These plural sections are made out of dermal bone and ribs. The spine and ribs are fused together and bonded to dermal plates found beneath the turtle skin. The shell itself has a hard outer layer made out of scutes, durable plates that protects the shell from standard wear and tear. The exceptions to this are aquatic turtles like leatherback sea turtles and softshell turtles. These specific turtles lack scutes. While other animals, like armadillos, also have protective outer shells, these shells are not fused directly to the rib cage or vertebral column. As a result, animals like armadillos can move their ribs freely within the shell. In contrast, the carapace of a turtle is bonded with the ribs and vertebrae. The underside of the turtle shell, the ventral surface, is referred to as the plastron. There are both posterior and anterior bridge struts here that affix to the bridge of the shell and thereby connected to the carapace. A turtle’s plastron has nine different bones located at the anterior divide, and these bones are considered homologous in nature to clavicle bones found in tetrapods apart from turtles. The other bones in the plastron are considered homologous to abdominal ribs. It is thought that the plastron evolved from the sternum of the ancestors of turtles, and indeed embryological studies have found that mutations in rib development frequently leads to the malformation of the plastron. Ancestral turtle fossils show that there are turtles with fully formed plastrons while their predecessors display an intermediate plastron made out of paired gastralia, dermal bones located in the ventral body wall of certain reptiles. Many amniotes accomplish respiration by relaxing and contracting muscles that are bonded to the internal rib cage of the animal, such as abdominal muscles or the diaphragm. This compression and expansion of the body wall helps move air in and out of the lungs. As previously mentioned, the ribs of chelonians are bonded with the carapace. Since the carapace cannot expand, turtles have had to evolve different methods for respiration. Turtles have a muscle sling that is fused with the shell and contracts/relaxes in order to ventilate the lungs, instead of contracting and expanding the lungs themselves, they rely on the power of this muscle, which wraps around the lungs, to ventilate it. The outer shell of a turtle is part of their skin, and one might be tempted to conclude that turtles molt like snakes do. Turtles do mold, but whereas snakes more or less molt all at once, turtles molt continually, sloughing off small pieces all the time. Tortoises will also shed their skin, but the dead skin of the tortoise frequently piles on and creates thick plates that provide extra protection to the tortoise. It is thought that the ancestors of turtles lived without hard shells. A 220 million-year-old stem turtle was discovered in China, and it possessed a partially formed dorsal carapace, meaning that the evolution of the turtle’s shell must have begun prior to this. Indeed, a 260 million-year-old stem reptile discovered in South Africa seems to have the early framework of a carapace. These early turtle ancestors had ribs that were much broader than other creatures at the time, and were arrayed in a cross-section. The shells of turtles are commonly a dark green, black, or brown in coloration. However, some species of turtles have much brighter shells, including yellow, red, or orange shells. 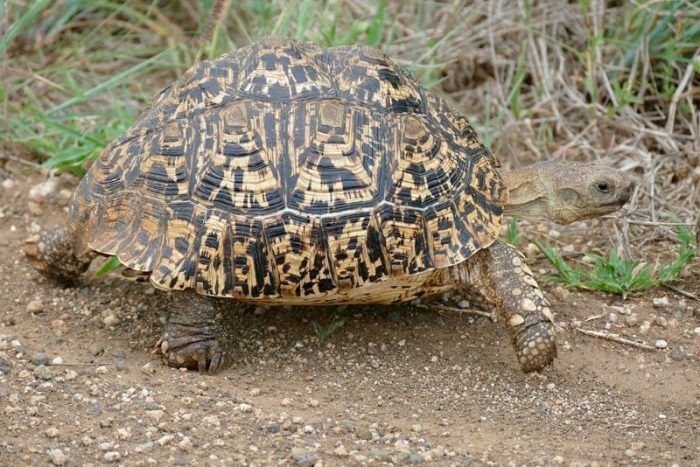 Tortoises have heavier shells then turtles, because they are primarily land-based. On the other hand, softshell turtles and aquatic turtles have lighter shells that enable them to swim faster and be more buoyant. There are seven recognized species of sea turtles in the world. The loggerhead turtle, the olive ridley turtle, the hawksbill turtle, the flatback turtle, the green sea turtle, the leatherback sea turtle, and the Kemp’s ridley sea turtle. All of the sea turtle species, except the leatherback sea turtle, belong to the Chelonidae family. The leatherback sea turtle belongs to the Dermochelyidae family. 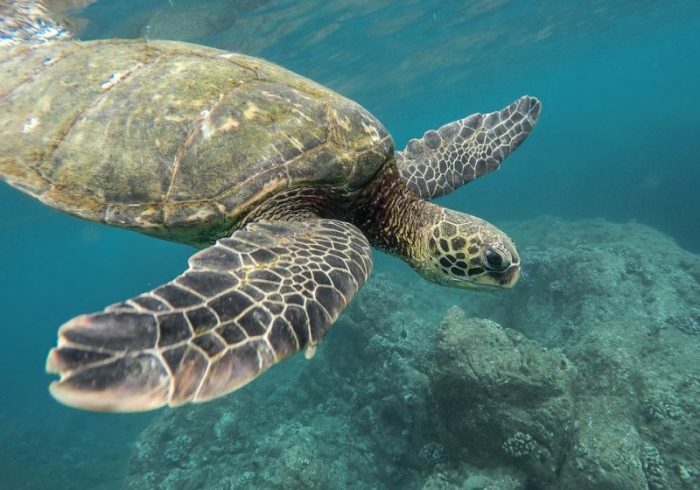 Sea turtles are found in the oceans all around the world except for polar waters. The Kemps Ridley sea turtle is found only along the eastern coast of the US and the Gulf of Mexico, while the flatback sea turtle’s habitat is found only off Australia‘s northern coast. Pond turtles, also called marsh turtles or terrapins, consist of a family of turtles made up of 50 different species across 10 genera. Pond turtles have smaller skulls when compared to other turtles, and their upper shell has one or two ridges found on it. 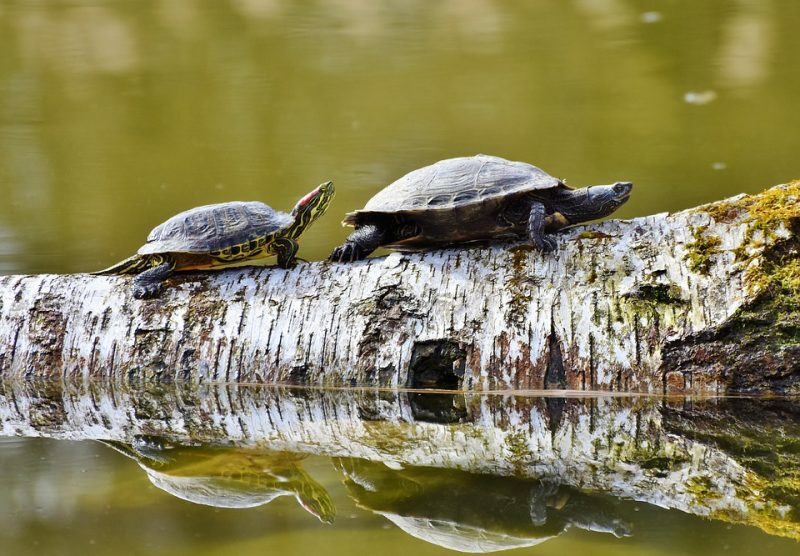 The subfamilies of pond turtles include box turtles, spotted turtles, the painted turtle, the chicken turtle, the diamondback hairpin, and sawback turtles. Pond turtles belong to the family emydidae. Softshell turtles are freshwater turtles found in North America, Asia, and Africa. The turtles are referred to as softshell turtles because the carapace of the turtle lacks scales. Instead, the carapace of a softshell turtle is fairly flexible and leathery in texture. This flexible shell helps them navigate lake bottoms and open water more easily. Softshell turtles have three clawed webbed feet. 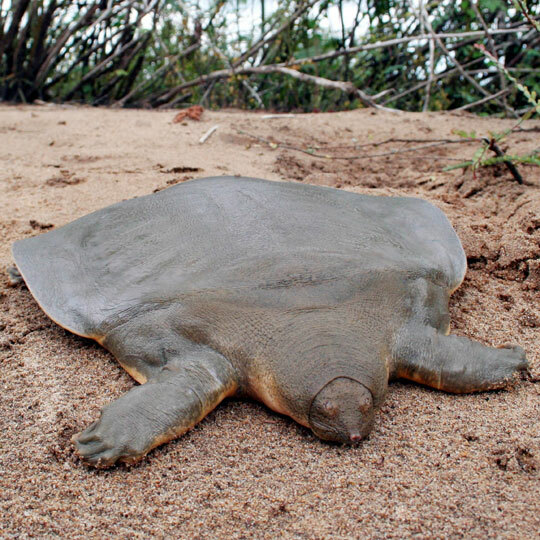 Examples of softshell turtles include the spiny softshell turtle, the Asian giant softshell turtle, the Yangtze giant softshell turtle, and the black softshell turtle. Snapping turtles belong to the chelyridae family, and they are known for their powerful jaws. In addition to plant material, snapping turtles frequently eat things like small reptiles, frogs, and fish. Snapping turtles are usually the top of the food chain in their environment, with few natural predators. 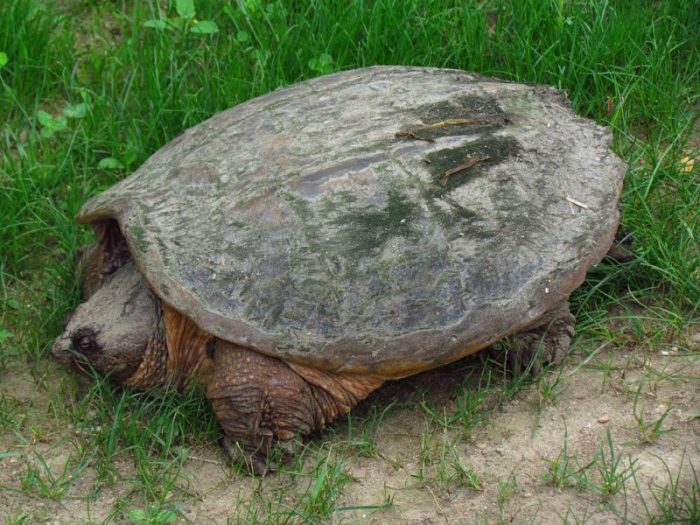 However, the eggs of snapping turtles are frequently preyed on by animals like foxes, skunks, and crows. Though not true turtles, tortoises are closely related to turtles, being under the same order – the order Testudines and the suborder cryptodira. Tortoise species are known for their long lives, and they can live between 80 to 150 years of age. In colloquial terms, tortoises are considered to live on land, while turtles are more aquatic in nature. Types of tortoises include the Aldabran giant tortoise, the African spurred tortoise, the Brazilian giant tortoise, the Santa Cruz giant tortoise, the Indian star tortoise, and the Gopher tortoise.